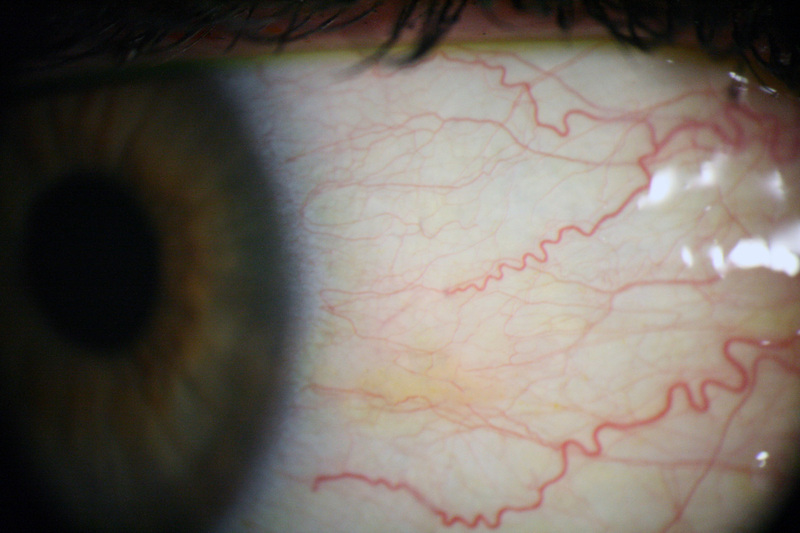 The Conjunctiva is a thin clear membrane that covers the majority of the eyes exposed surface and under the eyelids. 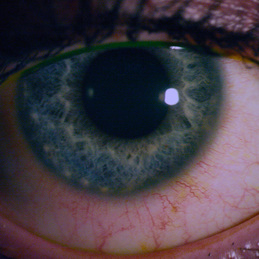 It does not extend over the cornea (the clear window of the eye with which the coloured is can be seen through). Closing the eye socket preventing any debris or contact lenses access to behind the eye. Mucous tear production - aids lubrication and comfort of the eye. Immuno barrier - preventing access by microbes and infective agents access to the eye. The Conjunctiva is a clear layer of tissue covering the majority of the eyes exposed surface. It can be seen here highlighted by the shiny surface covering the white area of the eye. Conjunctivitis is an inflammation of the Conjunctiva caused usually by in infection and is probably the most mis-diagnosed ocular condition of them all. It is quite widely know to cause irritation and redness of the eye, therefore, when a person suffers these two symptoms it is usually assumed that conjunctivitis is the culprit and a mild broad-spectrum antibiotic, usually Chloramphenicol (or "infected eyes") is prescribed. Conjunctivitis is NOT the only condition to cause these symptoms and it is well worth seeking a consultation to see if any more serious issues are present before commencing treatment. Conjunctivitis is a very mild but contagious disease which needs to be treated with care, It is often self-limiting (ie no medication needed). Antibiotics will only be effective with the bacterial form of the disease. There are many conditions which cause similar symptoms but are much more serious and need to be treated appropriately, therefore, it is always recommended that you seek the advice of a professional should you identify any of these symptoms. If you would like to ask our opinion regarding any redness you have with your eyes please book an appointment to see one of our Optometrists, see the Emergency Eyecare page by clicking here. The Conjunctiva extends to cover the undersides of the eyelids also. In this image the conjunctiva is inflamed seen here as small jelly like bumps.